Bixbyite with amethyst found in rhyolite. Pencil for scale. The Marysvale area is dominated by Tertiary igneous rocks ranging from intermediate to silicic compositions with both volcanic and plutonic representatives. The especially thick volcanic section is thought to be the result of a large stratovolcano complex and associated calderas that existed during mid-Tertiary time. 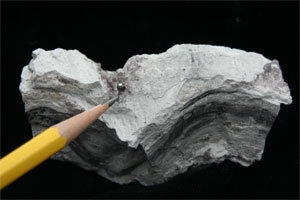 One of the common units found near Marysvale is a white to dark gray rhyolite with extremely well developed flow banding. The crystals, which are found in cavities in the rhyolite, formed in gas pockets that were trapped in the lava flow as it cooled. Bixbyite, a rare iron-manganese oxide, occurs as black, metallic, euhedral crystals up to 3/8 of an inch across. The crystals are generally complex combinations of various isometric forms including cubes, octahedrons, and dodecahedrons. Rutile is less common and appears as needle-like or bladed crystals up to 1/4 inch long. The amethyst crystals, ranging up to 1 inch in length, display excellent crystal form in various shades of purple. The small size of the bixbyite and rutile is more than compensated for by the excellent crystal forms of these relatively rare minerals. Travel 2.8 miles north on Center Street in Marysvale on US Route 89. 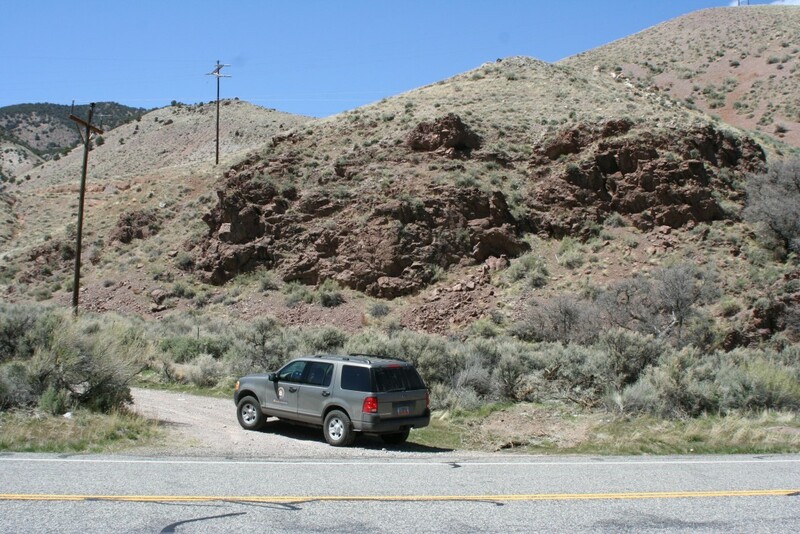 As you begin to enter Sevier Canyon, look for an unmarked gravel road (exactly at 2.8 miles) and turn left (west). Continue approximately 300 hundred yards where you can park alongside the gravel road. The rhyolite unit does not crop out within viewing distance of the collecting site. The area along the gravel road is a gently sloping field with a small dry wash running through it. 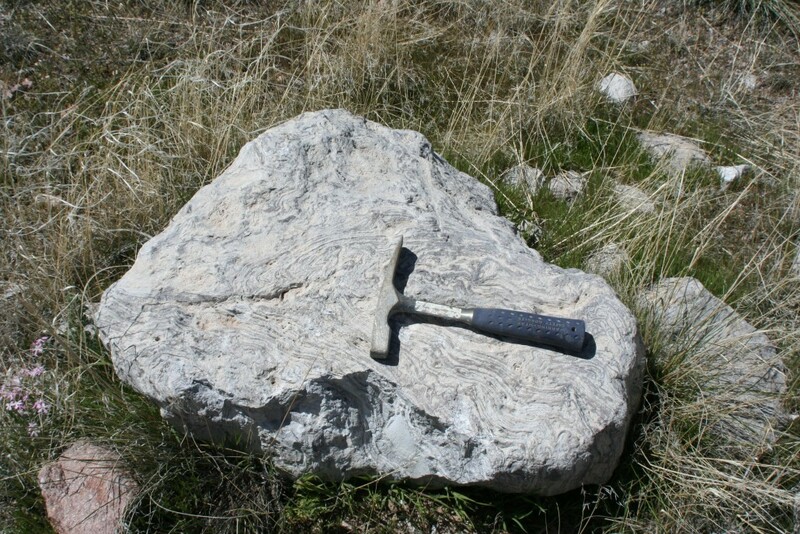 Boulders and cobbles of the rhyolite unit are scattered everywhere in the field and many good samples can be found just by careful examination of cavities in the rhyolite. Look for lighter colored pieces of rhyolite with a porous texture of abundant cavities and break them with a large hammer. Be careful as the rhyolite is hard and fragments are sharp. The best samples are found by carefully prying open the cavities in the smaller, broken pieces. Beaver and Richfield 1:100,000-scale metric topographic maps, and a Utah highway map are best for navigational purposes. The Marysvale 1:24,000-scale topographic map may also be useful. Bureau of Land Management (BLM) public lands. A hat and water are recommended, as are the following tools: safety glasses, a five-pound or larger sledge hammer, chisel, and newspaper or other suitable wrapping material. Have fun collecting! Stanley C. Hatfield is a geology professor at Southern Utah University where he teaches a variety of topics including mineralogy, igneous petrology, and metallic mineral deposits. Originally from Ohio, he has taught in Utah for over five years. Much of his free time is spent collecting rocks and minerals and conducting field trips throughout southern Utah.